Today i'm heating up the feature with OTK (Over-The-Knee) boots. What i do like about OTK boots is that it gives you the full coverage wanted during the cooler months but if you just want to wear it like its pop socks or stockings it acts as the alternative. 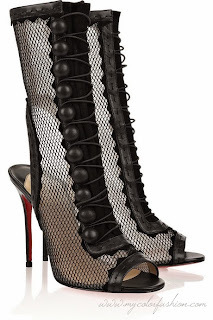 I thought i'd present these mesh lace up boots which features a gorgeous looking back heel frame design. I decided to style this loosely to have more movement flexibility for the stills below. I wore these with this long orange side split dress with splashes of blue-purple and white. I was meant to bring out the blue as the main color focus but i wanted to picture these boots and breaking up the color was just fine. These are comfortable, breathable and stretchy once you've discovered your size. I feel these go with so many fashion pieces, and possibly stretch jeans or to layer match tights with something short. The style is called Maxim 11 from Liliana. I think the look of the material makes it easy to wear as casual/day. 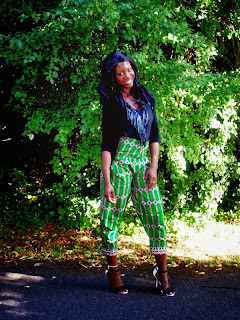 Its perfect for those transitional months and right about now i've been experiencing sunshine, so making the most of it. 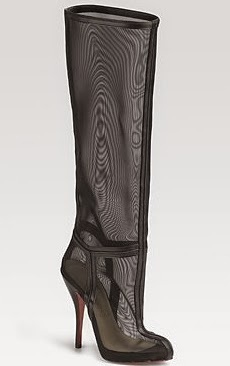 Maxim 11 Reminds me of the two Christian Louboutin Mesh Boots below without the red back :). I didn't say the same by the way! but the style is pointing in the right direction. I believe these would be perfect during the Spring/Summer months. One of the things that i'm neutral about is that it does look looser between the back lower thigh and upper calf area and not sure what to make of the look but this helps so as to not feel restricted, i guess. But i'll try adjusting the laces see it makes a difference. Also available in faux leather.